One dog at a time is generally all I can manage, but a few times in my life I have had multiple dogs. Years ago, I had three beagles at the same time. They were amiable little sweethearts, surprisingly, because they were all female (females tend to be more combative than males). Then I had two Jack Russels, one male and one female, siblings. Although they would occasionally get into a squabble, they were very close otherwise. I guess I have been lucky. I can’t imagine how upsetting it would be to have multiple dogs in the home that cannot get along. What a nightmare. According to the Humane Society, the average number of dogs per household in the US is 1.6 – 1.7%. Not sure how you get a .6% dog, but it’s definitely more than one dog! Multiple dog households are pretty common. Dogs are social beings and will generally thrive in the company of their pack family. I guess it’s just like humans, though, sometimes there is a disconnect with someone and for whatever reason, we just don’t enjoy their company. Or maybe it’s not the person so much as a misunderstanding. The conflict itself isn’t always with the person (or dog) present, but rather a situation. Something will set us off and an argument will ensue. Relationships between dogs are not all that different than relationships between humans. So what do we do if we have two or more dogs in our household that don’t get along? First, Evaluate the situation and take precautions. It’s normal for pets living together to get in a light scuffle now and then, just like human siblings. The difference is when it becomes too frequent, resulting in tension and hostility in the home. Our first job is to evaluate the situation: Is this an ongoing conflict or a one-time event? When did the fighting start? Does it happen often? Did the dogs get along in the past? Are there times that they get along? Are the dogs friendly with people and other dogs? Did your dogs violently attack each other resulting in injury and a trip to the vet? Scenario #1: The dogs don’t get along at all and cannot be in the company of one another. If the fighting is repeated and has resulted in a continual state of tension and aggression in the home, the dogs need to be separated immediately. This is a temporary fix for their safety and your family’s safety while you seek professional help. The more often the dogs get into fights, the more anxiety it creates. Eventually, someone – either human or dog – will get seriously injured. Keeping the dogs separated forever is not the end-all solution because that will teach them nothing. Plus, it creates additional stress for them and for you. If your dogs are to that point, we highly suggest you seek professional help as soon as possible. It is important that you are guided by someone who is trained to handle canine conflict. Dog aggression is a serious matter. The more intense the relationship between the dogs, the harder it will be to correct. Delaying correction allows more negative interactions with one another, more emotional tension, and possibly even more injuries. Scenario #2: The dogs normally get along but have been involved in a few clashes recently. Often a “scuffle” is a sporadic incident that quickly passes… kind of like when your kids fight with one another. If no further agitation has resulted from it, then we need only to keep a closer eye on them in each other’s company and watch for signs of tension. If “scuffles” seem to be on the increase, either by the number of scuffles or by intensity, there is usually some type of stressor causing the conflict. Our job is to find out what that stressor (or “trigger”) is, eliminate it from their environment, and then work with a Trainer to modify the behavior. Why are My Dogs Fighting? What should you be looking for? What are the “triggers” that could cause dogs in the same household to fight one another? It’s not just sibling rivalry. There are many. • Resource Guarding is a very common trigger. This refers to a dog guarding or protecting something they possess (the “resource”). This can any number of things – a toy, food, a bed, or even a person. The stressor is the anxiety the dog feels over the thought of losing his precious possession. A common example is food aggression in dogs. The dog will usually growl or snap to warn the other dog to back off. If the approaching dog doesn’t get the hint, a fight could easily result. • Redirected aggression is a strange but fairly common trigger. My male Jack Russel was somewhat aggressive. He would go absolutely ballistic when the next-door neighbor’s dog was in the yard. There was a fence between our yards which prevented him from getting to the neighbor’s dog. His inability to reach the other dog was very frustrating to him, causing him to redirect that aggression to whatever or whomever was near him… sometime his sister, and sometimes even me when I would attempt to intervene. • Excess arousal is a state in which a dog gets too amped up, often occurring in play or in moments of excitement. We sometimes see this at Camp Holiday Barn. The dog is on sensory overload and he is unable to calm himself. The increased level of arousal creates a stress response that precipitates the likelihood of aggression. The outcome is similar to redirected aggression in that the dog is unable to release that energy and may redirect it towards another dog. • Environmental Stress. There are many, MANY things that can cause environmental stress for a dog. They are so sensitive to changes in their lives. From a slight change in routine – like a family member being out of town a couple of days, to a major change – like a new baby in the house. Other environmental stressors may include seemingly insignificant things like people passing by the window, the sound of a vacuum cleaner, a ringing doorbell, etc.. These create disproportionate stress and anxiety for your dog. Environmental stressors can lead to harmful behavior, including aggression towards other pets in your household. • Health issues can cause a dog to react aggressively towards another dog. Dogs sometimes bite because they just don’t feel well and don’t want to be bothered. Whether it is discomfort due to injury or illness, your dog can easily become agitated when touched or even approached. Similarly, aggression may be a fear response to an older dog’s loss of vision or hearing. • Dogs will sometimes show aggression to their “siblings” in order to establish dominance. Dogs who snap, growl or bite other dogs to show dominance believe they are in charge. If they feel their dominance is being challenged by another dog, they may initiate a fight. • Lack of socialization and/or Training. Dogs who have not had the opportunity to commune with other dogs throughout their lives do not really know how to get along. A dog who is not socialized has not been taught proper doggie etiquette in interacting with others. Their inappropriate behavior could lead to an aggressive response. Furthermore, when you have dogs that fight, a lack of obedience training makes the modification process a little more complicated. Part of our Dog Training protocol involves impulse control. Impulse Control teaches the dog to stay calm instead reacting defensively. Not only that, but Training teaches the dog to focus on you, the owner or Trainer, rather than their circumstances or the other dog. • When working with your dogs, you need to learn to be an expert at reading their body language. Learn to distinguish between calm, relaxed canine body language: soft eyes, relaxed posture, etc., and anxious, agitated body language: rigid stance, tail raised and bristled, etc. It is only by knowing what your dogs are feeling that you will be able to intercede and coach. • If you have identified your dog’s stressors, try to eliminate as many of them from their environment as possible. i.e., Close the blinds so that the dogs cannot see people walking near their window; Have someone take the dogs for a walk before running the vacuum…that kind of thing. • Make sure your dogs have plenty of exercise as well as relaxation time. Pent up energy and frustration due to a lack of environmental enrichment will cause stress and hinder your progress. • Find mutually enjoyable activities for your dogs to engage in together. Leashed walks, swimming, car rides are some great, noncompetitive activities. • Sometimes the dogs need breaks from one another. Spending too much time together can cause stress and even aggression. Time alone will allow them to diffuse any built-up tension or irritation. Follow their lead on this point as sometimes separating a bonded pair of dogs even for a short period of time can lead to anxiety. • Reward good behavior towards one another. Quickly correct bad interactions. A Veterinary checkup is a smart first step. There could be a medical reason causing one dog to attack the other. As we mentioned before, if a dog who has never been aggressive suddenly starts initiating fights with their siblings, the reason could be illness, pain or disease. The solution may be as simple as alleviating the health issue, thus restoring peace and harmony in the home. Secondly, seek the help of a Professional Dog Trainer. Getting in-between two animals with a bone-to- pick (pun intended) with each other can be very dangerous. It’s a volatile situation and it would be easy to get in over your head. Plus you risk undoing whatever progress that has been made while the dogs were separated from one another. A Holiday Barn Pet Resort Dog Trainer will create a customized Training program to re-introduce the dogs to one another in a controlled setting, lead them towards acceptance of one another, and then manage their eventual interaction. The dogs must be professionally supervised throughout the behavioral modification process. We have determined that aggression is initiated by various types of stress. Regardless of the particular stressor, there are some stress relievers that can be very helpful as you help your dogs work through their issues. Exercise is vitally important in reducing stress, as is good nutrition. Another good stress reliever for dogs is having their own space. Often that is a crate; maybe just a quiet area of their own away from all the hubbub in the household. Other types of alternative stress reduction can be helpful: massage, aromatherapy, or soothing music. 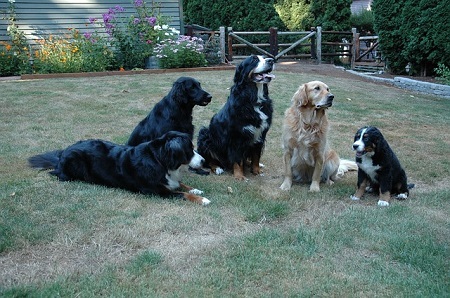 Dogs need a strong pack leader to establish rules and set limitations in the pack, or household. It can be said that dogs in a pack will fight if they do not have a strong leader. You are the pack leader in your home. Talk to our Trainers about how to present yourself as a calm, consistent, confident, leader to your pack. Error: Error validating access token: Session has expired on Monday, 29-Oct-18 09:08:51 PDT. The current time is Thursday, 18-Apr-19 20:01:49 PDT.